Next time you're driving down the street, take a moment to note that at nearly every intersection there's a street sign, and on nearly every building there's a number. These, believe it or not, are luxuries. Luxuries you won't frequently find in Rabat, Morocco. 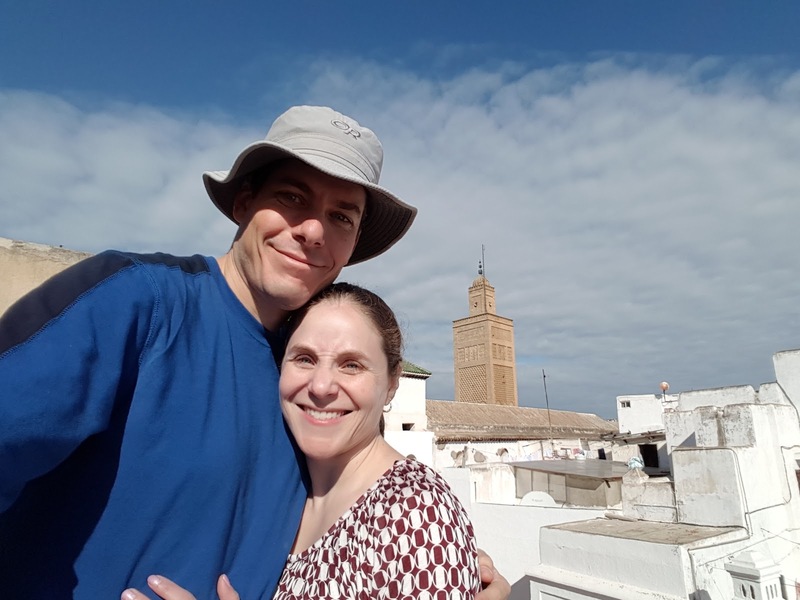 We know this especially well because we drove to nearby Sale, located just North of Rabat today, and finding our destination required us to combine our GPS, a local area map, a hand-drawn map by the hotel and a good bit of luck. But find it we did! And Shira's definitely getting the hang of this driving thing. Just treat every road like a free for all, and you're good to go. Sale was definitely worth whatever effort it took to get there. Thanks to an ad hoc Moroccan guide, we got an exhaustive tour of the old city. This included the Medrasa we were looking for (which had truly breathtaking architecture involving beautiful carved walls) as well as a tour of the fortress and prison which our guide book didn't even mention. Fun times! We got lunch at the market, which involved somes sort of sandwich stuffed with veggies while we convinced the chef to forgo the meat. As a bonus, we got a big 'ol glass of mystery juice, which Shira is quite certain was beet juice. Moroccan borscht, yum! As usual we found a bakery and went to town. We picked up 6 different pastries, which came to a total of about $1.60. Market food is just so cheap here. Like the olives we picked up yesterday: we got a sampler pack of 6 different varieties that came to a total of about $0.90. Oh and we picked up a persimmon that was at least two times the largest persimmon I've ever seen, and it tasted delish! After the tour of Sale, we searched out a collection of pottery stores. And sure enough, we managed to stumble on them. Like most shopping experiences in Rabat, it was incredibly low key. Folks were glad to answer questions, but nobody pushed us to buy anything. We chatted up one 20 something clerk who talked about how proud he was of the security and safety of Morocco. He also said that most folks his age have a simple dream: make it to Miami to party for a week. After that, he explained, he'll be able to die happy. It was hilarious. This is our last day in Rabat. Tomorrow we make our way to Marrakech, which has a reputation for being pricier and more of a tourst trap. Hopefully Rabat has prepared us well. Had our oddest Thanksgiving meal yet, a tuna panini, omelet, Moroccan salad and french fries. All for $7.50!